Japanese diapers gain popularity every day! Merries diapers are made in Japan from highly-qualified fabric. Merries nappies have a unique diaper shape that allows a baby feel comfortable and soft belly diaper band. 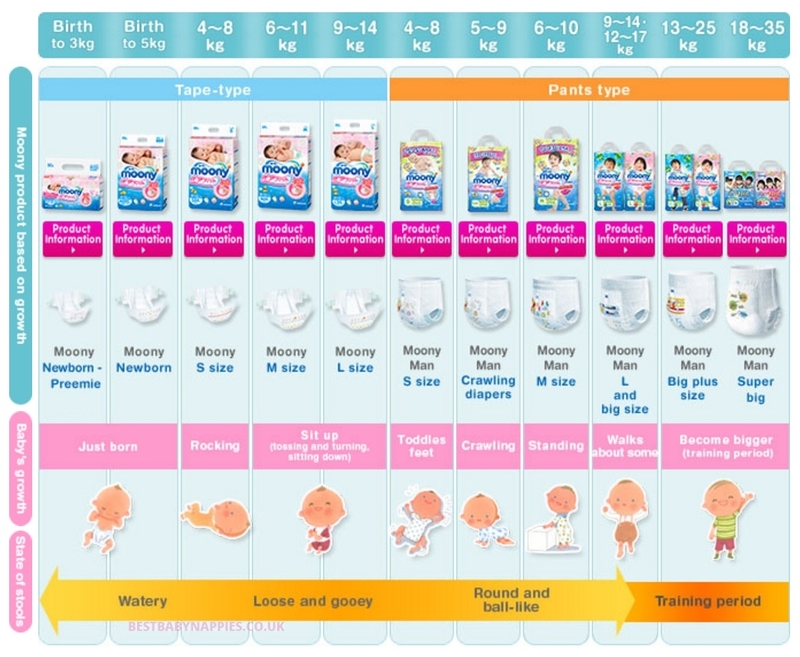 Merries diapers have a great size chart by weight. Merries small diapers (Merries diapers L size) are available in all regions of the UK. Merries diapers delivery is possible in big cities, such as London, Liverpool, Leeds, Glasgow, Edinburgh, etc, but also to all small cities, such as Bristol, Birmingham, Cardiff, Belfast, etc. Merries Small diapers fit babies from 4 up to 8 kilos. Merries S size diapers price for 82 items with sale from UK ! WHY TO CHOOSE MERRIES DIAPERS S SIZE? Inner diaper surface is made of the softest cotton which is hardly noticed by baby tender skin. Merries nappies prevent baby dry skin and help to avoid baby irritation! Merries nappies have dual channel absorbent core that draws in and locks away pee, thus protecting baby from irritation and letting baby feel comfortable for a longer time! Merries nappies are made of the microporous material that gives baby skin an ability to breathe and stay dry avoiding any problems! 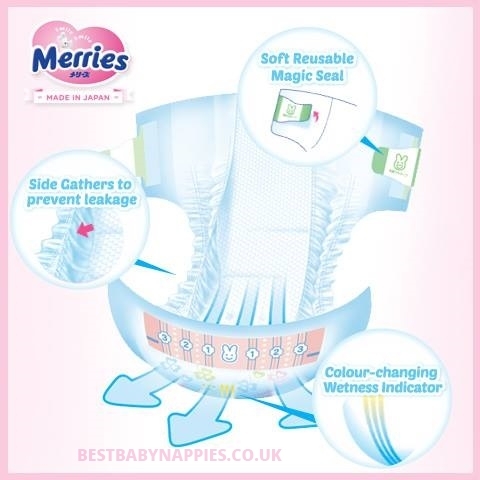 Merries nappies shape is exactly the same as the shape of the baby buttocks, thus the nappy has a tight contact with the skin, so baby has an absolute freedom of movements! Merries nappies have a special deepening in the rear part which keeps pee in until drawing in. This trick prevents from leakage saving your time and calm! Merries nappies offer five different designs that give your baby a chance to feel special! Merries tape diapers are exclusive nappies which change your baby’s and your life! You will be surprised how quickly you can change diaper even at night and your baby will feel comfortable and dry! 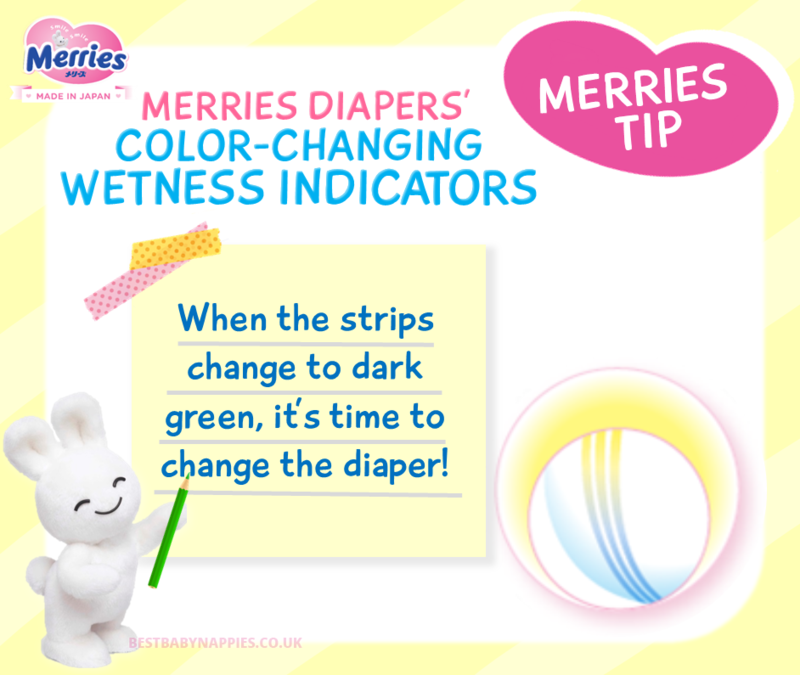 Merries nappies have fullness indicator that allows you to see when it is time to change the nappy! If the nappy is full and you have not an opportunity to change it now – do not worry! Special created dual channel absorbent core lets your baby feel dry and comfort for the whole day long! HOW TO BUY MERRIES DIAPERS?